Last month, United Health Foundation released the annual America's Health Rankings® report for 2016. Hawaii topped the nation as the healthiest state for the fifth consecutive year, while Mississippi once again brought up the rear. Tennessee came in at 44, keeping the state out of the dreaded 'bottom five' ... but just barely. The state has hovered between 42 and 45 for the last several years, coming in at 43 in 2015, 45 in 2014, and 42 in 2013. Iowa recorded the biggest improvement over the past year, rising from a rank of 22 in 2015 to 17 in 2016. Conversely, Maine saw the biggest drop, falling from a ranking of 15 to 22. The report, which has been produced for 27 years, provides clinicians, public health experts and policymakers with a snapshot of health trends in individual states and across the nation. The report's authors built the rankings based on the World Health Organization's definition of health, which says: "Health is a state of complete physical, mental, and social well-being and not merely the absence of disease or infirmity." The model used to rank individual states took into account four determinants of health - behaviors, community and environment, policy, and clinical care. The authors also noted, "In the 2016 edition, the report looks at historical trends and finds that the health of the nation is at a critical crossroad between making encouraging progress against long-standing public health challenges, while treading into dangerous territory on other key health indicators. For instance, the nation has experienced successes in reducing the prevalence of smoking, the number of preventable hospitalizations, and the percentage of the population without health insurance. However, the nation faces health concerns with drug and cardiovascular deaths and a continued high prevalence of obesity." On the plus side, the nation has seen a 41 percent decrease in the prevalence of smoking since 1990, including a 17 percent decline just in the last four years. Looking at Medicare enrollees, the rate of preventable hospitalizations has declined nationwide by 35 percent, including a 13 percent drop between the 2015 and 2016 reports. The authors also reported the number of uninsured Americans has hit the lowest point in the ranking's 27-year history with only 10.6 percent of the population remaining uninsured. Unfortunately, 2016 marked the end of a 26-year decline in the rate of cardiovascular deaths with the rate increasing from 250.8 to 251.7 deaths per 100,000 between the 2015 and 2016 reports. It also marked the second consecutive year with an increase in premature death before the age of 75. Additionally, drug deaths have been on the rise with a 9 percent increase over the past five years, including a 4 percent increase between 2015 and 2016 to a rate of 14.0 deaths per 100,000 population. Obesity continues to be a concern throughout America and contributes to a range of diseases and public health concerns. Since the first ranking report in 1990, the prevalence of obesity has risen by 157 percent in the United States. Nearly 30 percent of American adults are now clinically obese, and that figure didn't budge between 2015 and 2016. Hand-in-hand with the obesity rate is the stagnant physical inactivity rate, which has hovered at 25 percent of adults for the past 15 years. Like most states, even those ranking near the bottom, Tennessee has areas of excellence and other areas with definite challenges and opportunities. Tennessee scores very well in excessive alcohol use and leads the way for the lowest rates of abuse in the nation with only 11.2 percent of adults reporting binge or chronic drinking compared to a national average of 17.7 percent. The state also ranks in the top 10 in the country for high school graduation rates and comes in at number 13 for the lowest number of new cases of pertussis per 100,000 population. Conversely, the state ranked at the bottom in the average annual rate of change in smoking prevalence in adults from 2012 to 2016. Smoking rates are historically lower - and have trended downward since 2012 - among individuals who graduated from college or who have some college education. However, Tennessee was among a handful of states where the average annual rate of smoking prevalence actually increased for adults with some college, rising by 1.05 percent in 2016. Overall, the state ranked 43rd for smoking rates. Tennessee ranked 40th in drug deaths, 42nd in obesity rates, and 43rd in physical inactivity. In the past three years, Tennessee saw a 17 percent increase in drug deaths, rising from 15.7 to 18.3 deaths per 100,000 population. While the national obesity rate comes in at 29.8 percent of the adult population, Tennessee's rate is 33.8 percent. With a lack of physical activity correlating with obesity rates, it isn't surprising Tennessee ranks poorly in both. The U.S. rate of physical inactivity is 26.2 percent, but Tennessee comes in at 30.4 percent. Tennessee has varying rates when it comes to adolescent immunizations. While the state is a little below the middle when it comes to HPV vaccines for female adolescents, Tennessee ranks dead last for the same measure in males with only 16 percent of boys between ages 13 and 17 receiving the recommended three doses of the vaccine. Violent crime is another area where Tennessee faces significant challenges. The number of murders, rapes, robberies and aggravated assaults landed the state in the bottom five in the nation. Tennessee's rate of 612 violent crimes per 100,000 population is significantly higher than the U.S. average of 383 per 100,000 population. Tennessee stays out of the bottom five (barely) for cancer deaths and cardiovascular deaths, coming in at 45 in both cases. Tennesseans report frequent mental and physical distress, landing the state in the 46th and 49th slots respectively in the nation. 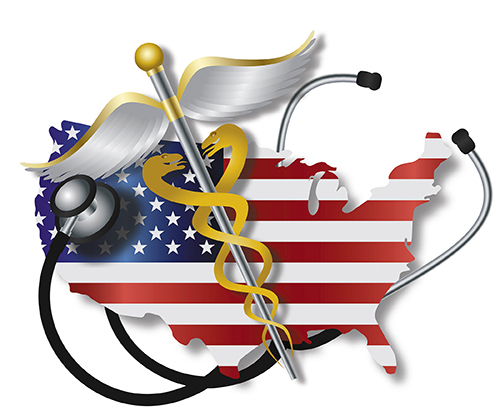 Tennessee's overall 2016 health ranking of 44th represented a drop of one place from 2015. The state ranks 43rd for senior health and 42nd for the health of women and children. To view the full report, go online to americashealthrankings.org or access the information from our website at nashvillemedicalnews.com.